In business since 2003, Integrity Home Pro is a full service remodeling company dedicated to exceptional workmanship and accountability. When we work on your roof, siding, kitchen, bathroom, or other project, we will always provide the highest quality of service and products available. We believe that it is our duty to never compromise our attention to detail and customer care because of costs. We stand by our work and our customers every step of the way. All of our technicians are fully trained and certified to carry out work needed. And we truly value our customers and the relationships we are able to build with you! If you are looking for an experienced, genuine remodeling contractor in DC, Maryland, Virginia (or DMV), you’ve come to the right place! The SELECT ShingleMaster program is designed for the top-notch professional roofer, and is used to gain a unique selling advantage in the marketplace. As a SELECT Shinglemaster you have a credentialed workforce, an enhanced ability to give superior value to customers, and an added selling advanced over the competition. In order to receive the title of Master Craftsman a contractor must study and pass the CertainTeed Vinyl Siding Master Craftsman written test. GAF Certified Weather Stopper Roofing Contractor program is a steep-slope program that screens residential roofers and trains them. Only 6% of roofing contractors are in this program, as many roofers are unwilling to go through the process. The National Association of the Remodeling Industry is a platform for advocacy and the main source for industry intelligence. NARI connects homeowners with its professional members and provides tips to consumers in order for them to have a positive remodeling experience. The National Roofing Contractors Association (NRCA) is known as one of the construction industry's most respected trade associations. 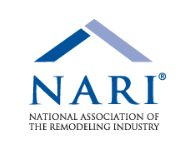 The NRCA is the voice of roofing professionals and is the leading authority in the roofing industry for information, education, technology, and advocacy. At ProVia, the top priority is serving and caring about others. ProVia shows that not only through the outstanding products, service and quality that customers have come to expect, but by caring for the smallest detail. 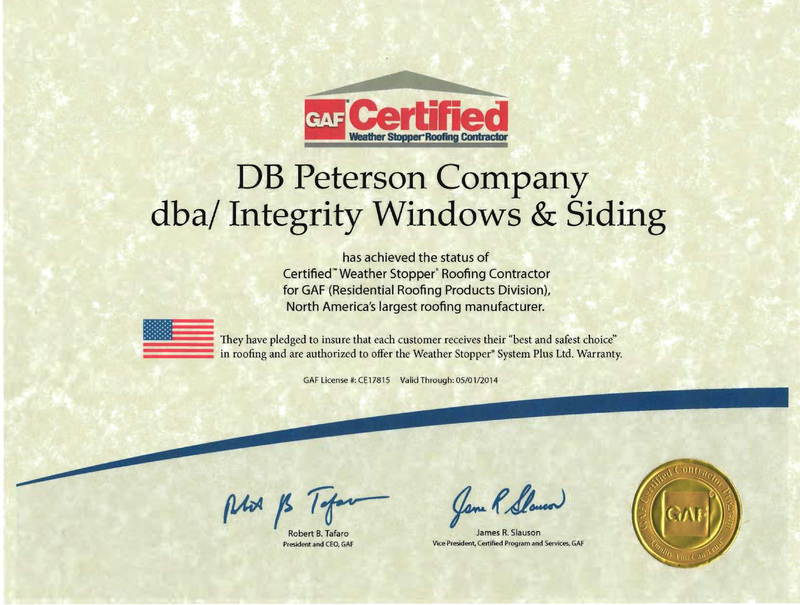 Certified Vinyl Siding Installers must have a least two years of installation experience and must have demonstrated knowledge on proper installation methods. The Greater Bowie Chamber of Commerce is the voice of the business community in the local area. The Greater Bowie Chamber of Commerce stays connected with federal, state, county and local elected officials through networking events and business forums. The Greater Bowie Chamber of Commerce hears from leading experts to help develop business strategies to help grow businesses. GAF Certification protects the warranties on a consumer's GAF Product purchase (windows, roofing, and more) when the installer or contractor is GAF Certified. Integrity Home Pro has been GAF Certified since 2004. 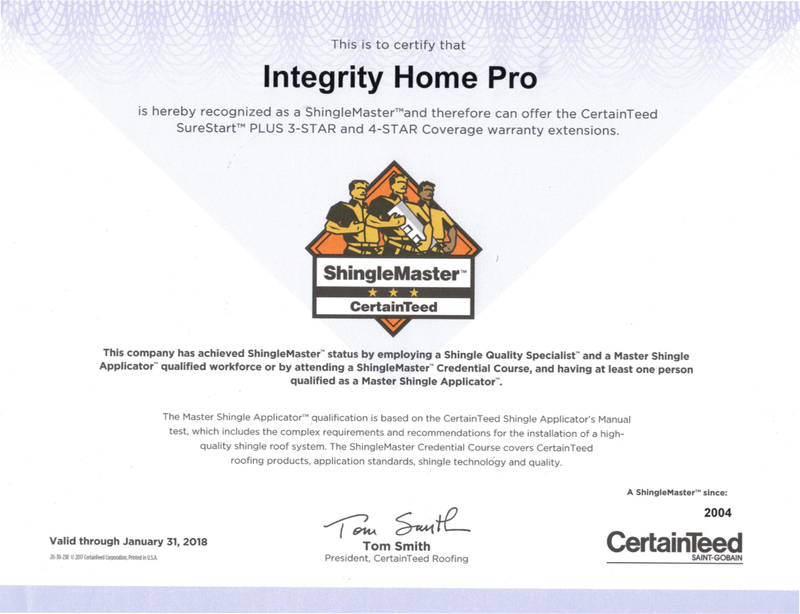 Master Shingle Applicator™ Certification provides workforce standards, produces high quality jobs, ensures warranty compliance, and sets this business apart from the competition by having its installers pass the Master Shingle Applicator™ test. 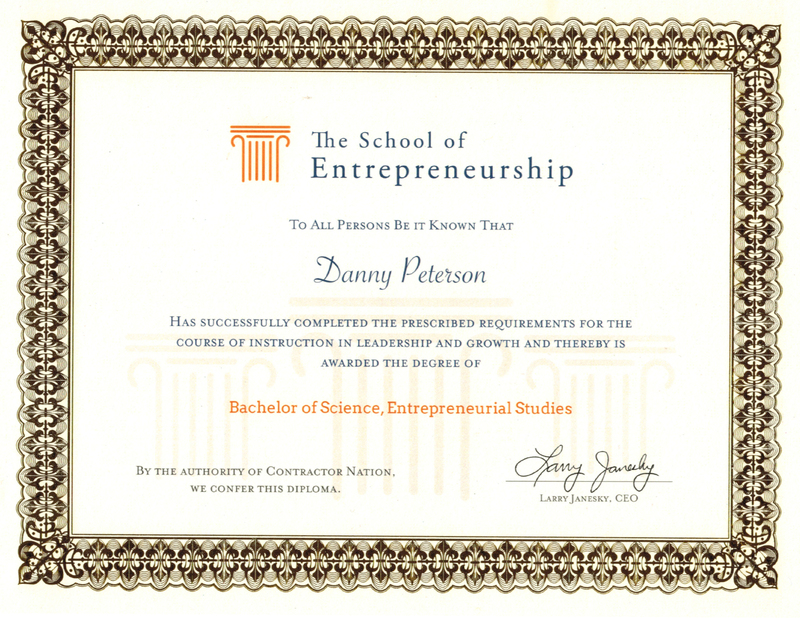 The School or Entrepreneurship has awarded Danny Peterson, of Integrity Home Pro, the Bachelor of Science Degree on August 7, 2017. The requirements for the degree encompassed a rigorous course of instruction in Business Management in Leadership and Growth. 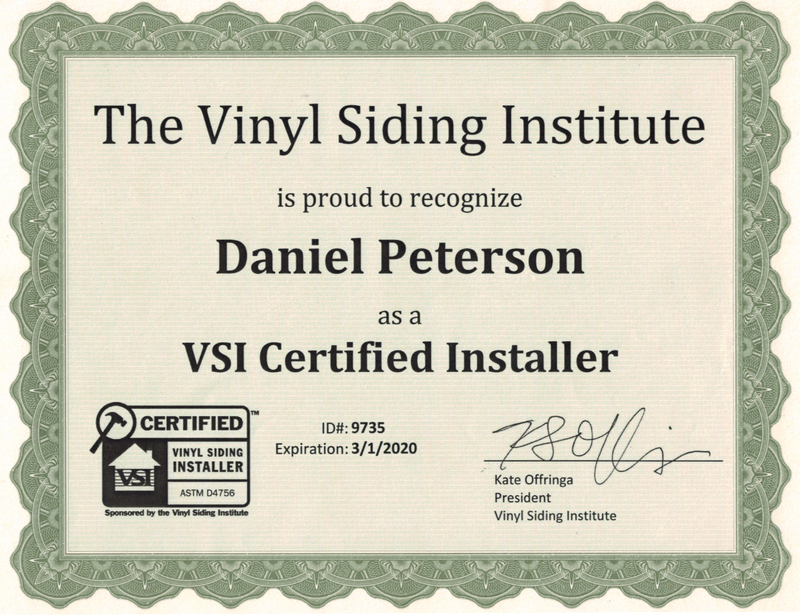 VSI CERTIFIED INSTALLERS Make the Difference Improper installation of vinyl siding can cause poor product performance, lead to customer dissatisfaction, and even void manufacturer warranties. Trained, experienced, and certified professionals help to ensure that installed home siding looks great and performs well for many years.